Due to an unexpected glitch in the social media universe, we recently lost our previous St. Mary's Facebook page. However, we have set up a new and improved page. All we need is you to "like" us again. So click here and like our new page. It is a great way for the parish to share with you the most current news and events, including recent pictures from our own seminarian Will Frei receiving the Ministry of Acolyte in Rome, another oﬃcial step to ordination to the priesthood. We also share upcoming events and special announcements about Mass times. While social media may have its pitfalls, it can also be used for tremendous good. I have a very important reminder from our Bishop regarding the Bishop's Annual Appeal (BAA). Each registered parishioner should have received information about the BAA at your home. If you didn't, simply visit www.sccatholic.org, where you can view the video and even donate securely online. Since an annual appeal was established fifty-seven years ago, the Catholic community of South Carolina, through its parishes, schools, and ministries, has enjoyed a long history of service and support for the people of our diocese. As I've mentioned before, as a truly Catholic (universal) Church, it is very important to reach out beyond our parish boundaries to do the work of Christ. The BAA helps address the needs of our en re diocesan family, reaching places we can't at St. Mary's. 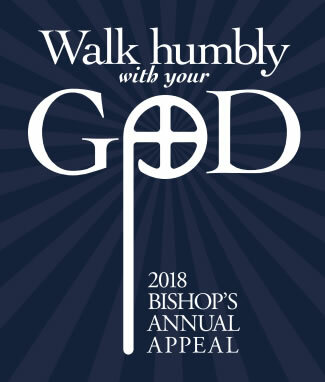 The diocesan goal for this year's appeal is two-fold: $4 million dollars in total donations from all parishes in the diocese, and also to achieve a 25% participation rate from each parish. All 117 parishes and missions in our diocese have been challenged by our Bishop with reaching 25% participation. This year, St. Mary's has a parish goal of raising $107,303 over the next ten months. The BAA is truly essential. It helps fund Catholic Charities, funding for retired priests, ministry on college campuses, youth and young adult ministry, greater outreach to the poor, support for our seminarians, and Catholic school tuition grants. Please make your pledge today as I have. Speaking of our Bishop, here's a reminder that His Excellency will be here on Sunday, March 25th (Palm Sunday) for the 11am Mass (bilingual), after which he will bless the beautiful new mosaic of Our Lady of Guadalupe, Patroness of the Americas and of the Unborn, in the garden next to the church. Finally, a Lenten reflection from Bishop Robert Barron: Jesus calls us to "be merciful, just as your Father is merciful." The more one draws on the divine life, the more one receives that life, precisely because it is a gift and it is inﬁnite. If you want to be happy, Jesus is saying, this divine love must be central to your life; it must be your beginning, your middle, and your end.